Don’t you love winter squash? There is something soothing about eating squash in the middle of winter with its creamy texture and hearty flavor. And you haven’t lived unless you have eaten baked goods with pumpkin puree or roasted pumpkin seeds. But eating either one of them during the winter might require your squash and pumpkins to travel miles to get to your doorstep. Just to give you a northeast gardener’s tip, squash and pumpkins mature in early fall, not the middle of winter. I Want my Pumpkin and Less Carbon Footprint too. I am right there with you sister. But what happen if you are not an obsessed gardener like I am? Or don’t have room for the rabbling vines of pumpkins and squash? (Boy can they take over.) My answer? Head to your local farmer’s market to buy some pumpkins and squash. Then read to learn how to cook pumpkin and squash to soothe your soul in the winter. I can’t give you advice about storing the pumpkins and squash because I failed miserly at doing this last year. Two months into storage, they started to mold. So, if you have any advice on this subject I am all ears. 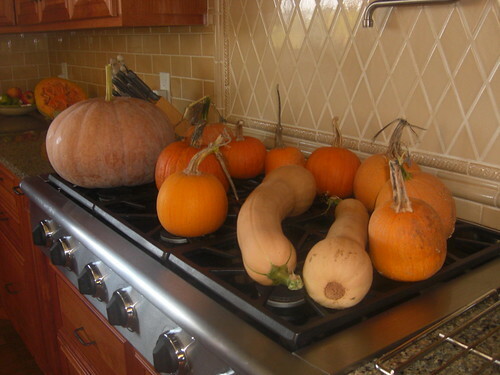 For the adventurous types, see this article about how to store squashes and pumpkins. What I can tell you is how to cook and freeze your pumpkins and squashes. The Pumpkin Cooking Solution. Storing No. Freezing Yes. This could take time since each one of my pumpkins took about 45 to an hour to cook. Make sure you have enough freezer containers to store your cooked veggies. For all you visual types who want the quick and dirty low down on cooking the squashes and pumpkins, watch the below how to cook squash video. When buying pumpkins buy the smaller ones since the large ones don’t have a lot meat and seemed not to be as tasty. Cut the pumpkin and squash in half. The small pumpkins believe it or not, are harder to cut than the huge large pumpkins. I think this is because the small pumpkins are denser. Scoop the stringy part and the seed out. You might not get everything and you can scoop out the rest when it is cooked. Place the pumpkins and squash cut side down in a pan about one inch of water and put tin foil tightly over the pan. I reused the tin foil over and over again. Cook at 375 degree until done. Approximately 45 minutes to an hour. While the veggies are cooking, wash off the “gunk” off of the pumpkin seeds, and place then on the side to dry. Roasted pumpkin/squash seeds are amazing. I periodically took a knife and tried to piece the skin since each pumpkin and squash seem to take a different amount of time. The large pumpkins took at least an hour and one half. Thereafter I started to cut the large pumpkins into quarters to speed up the cooking. I tend to cook them longer than most people since I don’t have the strongest hands. It was hard me to scoop out the flesh if the rind wasn’t really soft. Pumpkin pulp and squash pulp looks the same to me. Perhaps it is because of the variety of pumpkin and squash that I grew? Any thoughts on this subject? I did notice that the smaller pumpkins were a little darker inside than the squash. For you amazing bakers, can I interchange squash puree with pumpkin puree? Will a squash pie be the same as a pumpkin pie? Take the halves out of the water and store on a clean tray which can handle some water dripping out of the squashes. When the halves are cool, scoop them out. Don’t try this when the halves are hot. You will regret it. In my case, I burnt my hand and then dropped the squash. What a mess. Don’t be a yutz like me. If you want to puree the squash, you can put it in a food processor. Too much water or want a thicker puree? Cook it and drain it with a cheese cloth or coffee filter. I left mine in scoops since I wanted to be able to use it in different types of recipes. I used 4 cup and 7 cup containers. You can get any size containers you need. I was basing it on how much I usually use. If you don’t know, 2 cups is a safe size. Pumpkin seeds are very nutritious and tasty. They are high in protein, iron, zinc and phosphorous. You can roast them or make pesto with them. As I mentioned above, you need to wash the stringy “gunk” off the seeds first. I found an easier way to wash those darn seeds. I put them in a bowl with water and swished them around. Instead of pouring the whole mixture into a strainer, I took a slotted spoon and removed the seeds from the water. The pulp stayed at the bottom. Note, this trick only worked on seeds that I removed before I cooked the squash or pumpkin. When I tried this method on the seeds that were cooked with the squash, they just sank to the bottom of the bowl with the stringy gunk. I then laid them on a cloth and let them dry. (And they got stuck to the cloth too, but were easy to get off.) Thereafter, I put them on a cookie sheet sprayed with PAM. Sprinkled them with salt, pumpkin spice, and then sprayed oil spray on them. You can easily do this in a mixing bowl and use some oil to coat the seeds. I also don’t use alot of salt since I don’t like the taste of salt. Bake at 300 degrees for about 20-25 minutes. I watch them so they don’t burn. Store them in air tight containers in cool dark place. Mine are stored in the refrigerator. Check out this article featuring other types of roasted pumpkin seed recipes for some added flair. Let me know how you like these recipes. You go first…Do you have a favorite pumpkin seed recipe? Spill! What are your favorite squash or pumpkin recipes? How do you roast pumpkin seeds? How do you store your pumpkins and squashes? Winter Soup Cookbook: Taking the Chill out of Winter. I would have never thought to have froze my pumpkins or squash the pictures and video are great I absolutely loved this post thank you so much!! I haven’t heard of storing pumpkins without canning or freezing them. Last year was my first year of baking a pumpkin and puree’ing it. Everyone told me that my big Halloween pumpkin wouldn’t taste as sweet as a little pie pumpkin. I used it for pumpkin black bean soup and the family liked it. This year we have pie pumpkins and big pumpkins so I guess we’ll be able to taste test later this year! oh my goodness. those pumpkin looks delicious.. they would make an excellent pumpkin pie this halloween.